Hole is a fitted wall that answers to the rules of modularity, constructive simplicity and facility of assemblage. 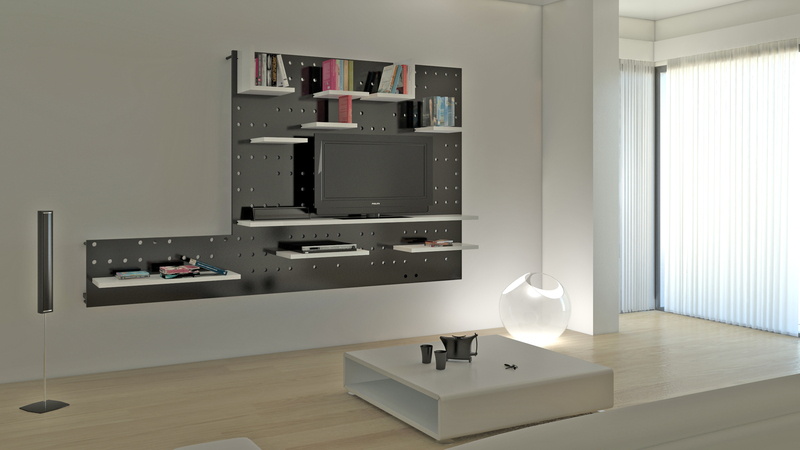 The basic form is constituted by a perforated plywood panel to which it is possible to attach some shelves of various sizes, leaving to the user the a great flexibility in the composition. Every panel is equipped at the base with led that creates, through the holes, suggestive chromatic effects in the environment. The second function of the holes is make pass the wiring of the technological devices to allow their disappearance. The wiring is finally carried to the back base of the panel, equipped with a multiple socket.